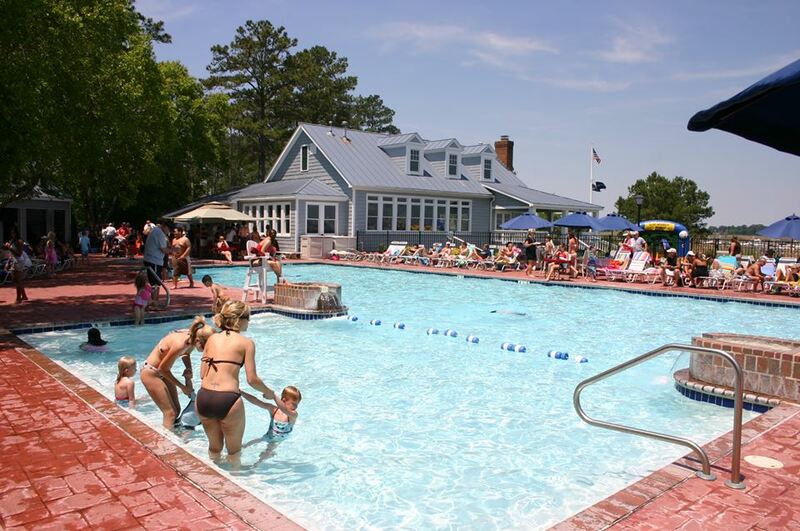 During the summer months, members of The Gatling Pointe Yacht Club enjoy a spectacular aquatic center. With breathtaking views of the Pagan River, and walking access to the clubhouse, tennis courts and marina – this is a neighborhood pool like no other. And parents, you can rest assured that our Red Cross certified lifeguards will be providing a safe swimming environment for you, your children and guests. The pool will be open from 10-11 am daily for adults only beginning June 15th. A lane will be set up for lap swimming. Please note our guards will continue with their opening duties during this time. No children may be on the pool deck or in the pool during this time. (The only exception to this rule is swim lessons). Children between the ages of 10 and 14 years may take a swim test in order to gain the privilege of coming to the pool without an adult. The test consists of entering the pool in the shallow end and swimming across the pool to the deep end. The child must be able to do this comfortably, without using flotation devices. He/she must also be able to tread water. Ask any lifeguard if you would like your child to take the test. Please remember this is a privilege and may be taken away for inappropriate pool behavior. We now have noodles and pool side games available for check-out at the pool desk. We also have a used paperback bookshelf where you may borrow or trade books. Please sign your guests in at the pool desk. Guests may NOT reside in Gatling Pointe. Enter and Exit the pool at the check-in desk, if you enter from the dining room please go straight to the desk and check-in. Your update and pictures will be checked each visit. Guests who are visiting family members need to stop by the club office to get a temporary ID card if you will not be accompanying them to the pool. Guests who are joining you for a day at the pool will be charged. Guests may NOT reside in Gatling Pointe. Please see our new guest policy for fees. In order to not jeopardize our ABC license, all alcohol consumed on club premises must be purchased from the club. You may order drinks, snacks, meals, etc. at the snack bar window or from one of our wait staff who will be taking orders poolside. You may also bring snacks and non-alcoholic beverages from home. No glass containers please. Staff reserves the right to check all coolers and containers. Please remember if you are going into the main dining area, you must put on dry clothes and be wearing shoes. Please be sure that you are dry before coming into the dining room, a cover-up over a wet suit or wrapping in a towel are not acceptable levels of dress for our dining room. Thank you for discussing these rules with your children, guests and family members. Following these rules will help insure a safe and enjoyable pool experience for all our members. Due to our newly expanded membership area, we have had to revise our guest policies and some of the rules. The following policies will be in effect for the 2014 pool season. 1. Guests shall register upon arrival with host member. 2. Non-member Gatling Pointe and Gatling Pointe South residents may not be guests. 3. Guests who live in our expanded membership zone (Smithfield and Isle of Wight County) will pay $10 per person in pool guest fees. 4. 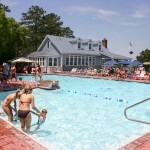 Guests who live within a 50 mile radius of the club will pay $5 per person in pool guest fees. 5. As always, out of town house guests (more than 50 miles away) and immediate family members (children, granchildren, siblings and their children, parents) are complimentary. If you have out of town guests or family members who will be coming to the pool without you, you will need to stop by the office and get a temporary membership card for them. 6. All guests must present an ID when signing in. If they do not have an ID then the $10 guest fee will be charged. 7. All guests (except infants) will be charged, even if they don’t swim when they enter the pool area. 8. There is no guest fee charged for non-residents that are only joining you in the dining room for a meal. We often have requests from our members to host birthday or team parties at the pool. These are the policies if you wish to do this. 1. The date must be scheduled a minimum of 10 days in advance, so we can have adequate staffing. 2. The maximum number that may attend the party is 25 (includes children and adults). 3. The fee to book a party is $50 and this will include a small drink for up to 15 children, one 6 foot table and a small area reserved for your group. Additional beverages may be purchased from the club. 4. You may order party trays from the club at special prices – please consult with Sean. 5. You may hire an additional lifeguard (based on availability) to be directly responsible for your group in the pool and lead some pool games. The fee for this is $10 per hour with a minimum booking of 2 hours. 6. You may also hire a party attendant to help (set-up, clean-up, get drinks, serve food, etc) with your party at a fee of $10 per hour – minimum 2 hours. 7. You may not bring guests inside the clubhouse without first having them change out of wet swimwear. Wrapping in a towel or putting on a cover-up over wet suit is not acceptable – they must be dry. Shoes must be worn at all times in the clubhouse. 8. If you desire a private party or a party during times we are not open or have a group of more than 25 people, you will be charged our regular rental fees. Please see Sean to book this option. 1. Lifeguard and staff members are here for your safety and must be obeyed at all times. 2. Your membership must be checked with each visit to the pool. Each family member must have a current picture on our computer and your membership update form must be complete. 3. Please shower before entering pool and remind children to rinse sandy feet when returning from playground. Parents are encouraged to supervise children on playground, use of playground is at your own risk. 5. Children ages 9 and under will NOT be admitted without a parent or caregiver (minimum age 14.) This person must remain with the child in the pool area. 6. Children ages 10 and up may come to the pool unaccompanied, if they have passed the swim test. 7. Children ages 9 and under who are not able to swim a length of the pool and any child wearing a flotation device must have a parent or caregiver (minimum age 14) in the pool with them. 8. All children who wish to swim in the deep end of the pool must pass the swim test to swim unaccompanied by an adult. 9. The baby pool area is for children 6 and under. A parent or caregiver (minimum age 14) must be in the pool area with the child. 10. Children under the age of 3 are not allowed to be in the pool without a parent. Any child 2 or older must vacate the pool during adult swim. 11. Please walk at all times on pool deck. 12. Running, pushing, horseplay and abusive language will not be tolerated. 13. Swim masks, snorkels, noodles, kick boards and other pool toys may only be used with permission from the guards, who have the right to limit their use when it might create unsafe conditions. 14. Super Soakers, dive sticks and water balloons are not allowed in pool area. 15. NO glass containers of any kind are allowed at pool facilities. Members are welcome to bring refreshments in non-breakable containers. Snacks and drinks must be consumed away from the side of the pool. 16. Due to ABC laws, all alcoholic beverages consumed on club premises must be purchased from the club. The club reserves the right to inspect all coolers. 17. Under threatening conditions, the pool area will be cleared for 30 minutes for thunder and 1 hour for lightening. If conditions persist, the pool will close until safe conditions return. 18. Our guards will use the “3-Strike” Policy to enforce rules. 3. Send home for the day. If behavior continues to be a problem, pool privileges may be suspended for a longer period of time, or the child may loose the right to come to the pool without a parent.